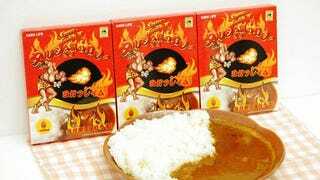 In Japan, "Dhalsim curry" recently went on sale. Dhalsim, of course, is the fire-breathing fighter from Street Fighter II. Curry, of course, is delicious. Website Gigazine tried out the curry, which it described as extremely hot, causing the site's reviewer to break out in a sweat. As you can see, the box says the curry is made with habanero peppers. It's an official Capcom product! If you've never had Japanese curry, it's sold in packets like this that can easily be heated up and served with rice. Of course, people make their own curry as well. Gigazine does not recommend eating the Dhalsim curry unless you like extremely spicy food—oh, and Street Fighter. Offered by web retailer Geek Store Life, the curry is now sold out. A pack of five went for 2,700 yen (US$26), which makes this rather expensive for curry. For example, a pack of your typical Japanese curry goes for around a dollar. But can you really put a price on Yoga Fire? For more pictures, check out Gigazine in the link below.